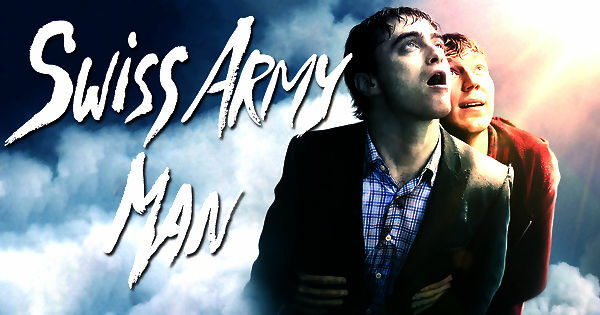 „Swiss Army Man” podąża śladami Hanka (Dano), młodego mężczyzny znajdującego się na opuszczonej i zapomnianej przez Boga bezludnej wyspie. Pewnego dnia bohater spotyka Manny’ego (Radcliffe), trupa, który swobodnie unosząc się na morzu dociera do wybrzeża jego „więzienia”. Obaj szybko nawiązują nić porozumienia i stają się najlepszymi przyjaciółmi. Razem postanawiają wyruszyć we wspaniałą podróż, która ostatecznie zaprowadzi Hanka z powrotem do dziewczyny jego marzeń! Hank, a man marooned on an island is on the verge of hanging himself, but sees a corpse wash up on the beach. He tries to resuscitate it, but the corpse bemuses him with its incessant flatulence. As the tide begins to wash the corpse away, Hank watches as its farts propel itself around on the water. Hank immediately mounts the corpse and rides across the ocean like a jet ski, landing on a mainland shore but far from civilization. That night, the two of them hide in a cave, and after the runoff pours into the corpse’s mouth, Hank realizes the next morning that the corpse has yet another power in which it can be used like a well for a seemingly infinite source of drinkable water. The corpse also begins a slow transition into speaking and a grasp on the English language, adopting the name Manny. Hank and Manny continue their quest, using Manny’s erections (fueled by a swimsuit magazine they find) as a compass. Manny has forgotten everything about his former life, and Hank tries to teach him various concepts about life, but Manny’s childlike and shameless interpretations of these concepts conflict with what Hank considers socially acceptable behavior. Over the course of their journey, Hank teaches Manny the joys of eating out, going to movies, and partying, using crudely-constructed props and sets made from plants and garbage they find. Using these, Hank leads Manny to believe that Manny is in love with a woman named Sarah, who rides the bus alone every day. Manny falls in love with Sarah, and it is this love that motivates him to try and find civilization with Hank. In reality, Hank is very much in love with Sarah, having seen her riding the bus every day but never talking to her due to his own shyness. He has a photo of her that he took secretly while on the bus set as the wallpaper on his phone and follows her on social media. As he looks through photos, it is revealed that Sarah is happily married and has a child. Manny and Hank have a falling out after Hank reveals that Manny never knew Sarah during his life. Feeling betrayed over Hank’s hypocrisy and self-restraint, Manny states he wishes to be fully dead again. At this time Hank experiences strange mental flashes of surreal images recalling his journey and suggests that one of Manny’s powers is to affect his mind. Despite the tension between them, when Hank is attacked by a bear Manny moves under his own power for the first time, crawling after his injured friend and lighting one of his farts from their campfire to scare the bear away. Hank loses consciousness and wakes up to Manny carrying him to Sarah’s house, despite Hank’s protests. While Sarah is in the house, Manny talks to Sarah’s daughter, Chrissy, though she becomes frightened when Manny gets an erection, which Hank quickly slaps down. Sarah is alerted by her daughter’s crying and calls the police at the sight of Hank and Manny’s once-again inanimate corpse. Hank is soon patched up, but the cops discover the photos of Sarah on his phone and become suspicious. Hank’s father also appears, mistaking Manny’s corpse for Hank when asked to confirm by the paramedics. After being interviewed by the local news and deliriously professing his gratitude for Manny and his magical powers on air, Hank runs away with Manny’s body. Hank’s pursuers discover the structures he built which in actuality seem to be quite close to Sarah’s house, as if he had been there some time instead of journeying through the forest. The police, Sarah, her husband, her daughter, a reporter, a camera man, and Hank’s father all follow him to the beach. Cornered, Hank lets out a long fart as he is taken away by the police. Shortly after, to everyone else’s shock, horror, and in Chrissy’s case, glee, Manny begins violently farting until he floats back into the ocean and skims quickly away, propelled by his own flatulence, he and Hank sharing one last smile.